Welcome to Covering Your Asset! A single item having value or exchange value. What would be considered to be your most valuable asset? You and the security you can offer to your family. 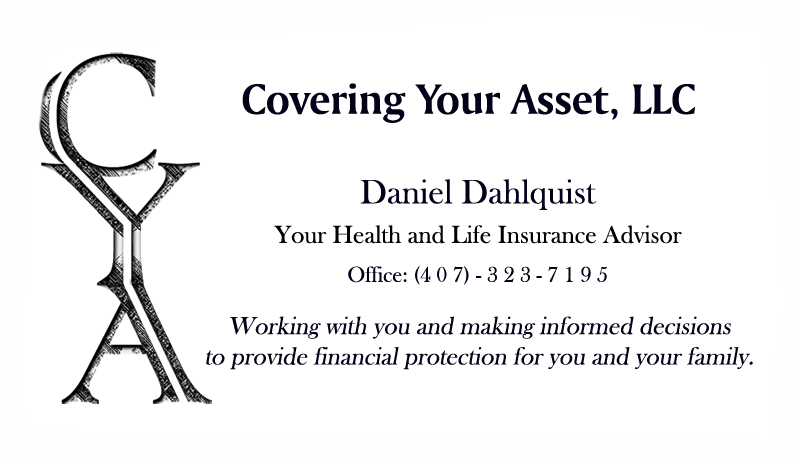 The various forms of health and life insurance are designed to protect you (an asset) from large amounts of financial loss and to make those amounts, in worse case scenarios, financially manageable. Designed to protect you from large financial losses due to potential medical expenses, provide emotional security, increase quality of care received. When combined with high deductible major medical health plans, makes health insurance plans more affordable and allows for major tax advantages. Provides financial security and protects your family against future financial hardships should you suffer loss of life. Replaces a portion of your income if you are unable to work due to disability/injury for short or long period. Workers compensation will cover you if it is an on-the-job injury. What do you do to replace income if you get injured on an off-the-job injury and are unable to work for a period of time? Provides funding if you are unable to work and are in need of long term care at home or in a nursing facility. Cost effective dental insurance and dental discount plans are available to help reduce costs for dental care. You have one set of teeth so it pays to take good care of them. If you are 65 or older or on Medicare disability, there are other plans you may also be able to benefit from such as Medicare Advantage plans, Medicare Supplements, and Medicare Prescription plans.